PURPOSE: Carotid artery stenosis quantification uses percent diameter ratios from conventional angiography. Multidetector high-speed CT angiography (CTA) allows direct millimeter measurement of carotid stenosis. We hypothesize a linear relationship between millimeter stenosis measurements and derived percent, alleviating cumbersome ratio calculations. METHODS: Two neuroradiologists separately reviewed CTAs of 268 carotid arteries, blinded to other information. The narrowest portion of each carotid stenosis was measured in millimeters from axial source images. Distal internal carotid arteries (ICAs) were measured beyond the bulb, where walls are parallel. North American Symptomatic Carotid Endarterectomy Trial (NASCET)–style ratios were calculated for each ICA, except for suspected near-occlusions. Interobserver agreement was calculated for all measurements. Correlation coefficients were calculated comparing millimeter and derived percent stenosis, followed by regression analysis. Sensitivity and specificity values tested validity. RESULTS: Interobserver agreement correlations were excellent, from 0.78 to 0.89 (2-tailed P ≤ .01). Excellent reader correlation permitted averaging of millimeter stenosis and distal ICA measurements, which were then used to calculate mean percent stenosis. Stenosis assessment was confidently performed from source images even with calcification. Regression analysis of mean percent as a function of mean millimeter stenosis shows a linear relationship, correlating 1.3 mm to 70% and 2.2 mm to 50% NASCET-style stenosis (Pearson’s correlation of −0.95; n = 136). Direct millimeter measurement defining severe stenosis (70% or greater) has sensitivity of 88.2%, specificity of 92.4%, and negative predicted value of 98.2%. CONCLUSION: There is a linear relationship between millimeter carotid stenosis diameter and derived percent stenosis. This allows prediction of NASCET-type percent from millimeter stenosis. Current high-speed, multidetector CTA techniques allow for direct evaluation and measurement of carotid lumen diameter and the surrounding soft tissues. We show advantages of quantifying carotid stenosis by direct millimeter measurements instead of by cumbersome ratio calculations. In addition, we add clinical meaning to these millimeter measurements by showing their relationship to the well-known North American Symptomatic Carotid Endarterectomy Trial (NASCET)–style ratio calculations. This relationship has important implications regarding guidelines for revascularization procedures, specifically that of carotid endarterectomy. CT angiography has evolved along with the technologic advances of CT hardware and software. Modern CT angiography, performed with multidetector high-speed CT hardware and evaluated with 3D reformatting software, accurately and reliably depicts carotid disease,12–16, 18, 19 and allows for direct quantification of carotid stenosis in millimeters. We hypothesize that direct millimeter measurements of carotid bulb stenosis and derived percent ratios are related in a linear fashion. This relationship is expected, because stenosis diameter is part of the calculation of the percent stenosis ratio. Regression analysis can predict percent stenosis from any given direct millimeter measurement of stenosis. Examinations were retrospectively collected from a single institution from August 2003 through March 2004, by using an AGFA Impax 4.5 (Mortsel, Belgium) PACS data base. Examinations from consecutive patients with the history of known or suspected carotid artery stenotic disease were entered into the study. Examinations were not included if the purpose of imaging was due to trauma, dissection, vascular anomaly/malformation, tumor evaluation, or primary evaluation of the posterior circulation. Examinations were excluded because of inadequate coverage and/or technical errors precluding full evaluation of the cervical carotid arteries. The study was approved by the Sunnybrook and Women’s College Health Sciences Centre’s Research Ethics Board (project identification number 411–2004). Informed consent was not required for inclusion into this retrospective study and its evaluation of records and images. All CTA examinations were performed by using a GE Medical Systems (Waukesha, Wisc) Lightspeed Plus 4-section helical CT with a 6.3-MHU Performix tube. Images were obtained from the C6 level to the vertex by using the helical HS mode with 7.5 mm/rotation and 1.25 × 1.25 mm collimation (120 kVp, 350 mA). Intravenous access was via an antecubital vein by using an 18- or 20-gauge angiocatheter. A total of 100–125 mL Omnipaque 300 were injected at a rate of 4.0 to 4.5 mL/s, with a 17-second delay or the use of Smart Prep at the pulmonary artery. CT technologists performed all the postprocessing multiplanar reformats (MPRs) at the CT operator’s console. Coronal and sagittal MPR images were created as 10.0 mm thick, spaced by 3 mm. Bilateral rotational MPRs were created at the carotid bifurcations with a thickness of 7 mm and spacing by 3 mm. 3D rendered images were created on a GE Advantage workstation. All images were viewed on AGFA Impax 4.5 PACS workstations (Fig 1). CTA showing right severe carotid bulb stenosis with deep plaque ulceration. A, Axial source image. B, Sagittal reformat. C, 3D rendered image (large arrow, stenotic ICA; dashed arrow, bulb plaque ulcer; small arrow, proximal ECA). CTA axial source images provide the most reliable measurements for stenosis when comparing CTA with DSA.12–16, 18, 19 Millimeter measurements were obtained by using the submillimeter measurement and magnification tools on the PACS workstation. Special attention was directed to some of the more densely calcified plaques, with extra windowing and verification of findings from endarterectomy. Measurement of carotid stenosis was at the narrowest portion of the carotid bulb on the axial source data (Fig 2). MPRs identified the carotid orientation to ensure true cross-sectional measurements. Internal carotid arteries (ICAs) identified as passing oblique to the axial plane were measured perpendicular to their own oblique carotid axis as seen on MPRs. These measurements were verified with measures from reformats to ensure accuracy in obtaining the narrowest diameter in a true cross-sectional plane (Fig 3). Carotid stenosis measurements were obtained from axial source data at the narrowest portion of the carotid bulb. A, Source image. B, Magnified right carotid portion. C, Submillimeter measuring tool determining 3.2 mm (0.32 cm). Oblique artery measure. A, Axial source image with arrow toward ICA. B, Sagittal reformat showing oblique ICA axis of a slightly tortuous ICA. C, Axial measurement, perpendicular to oblique axis. This demonstrates a need for viewing reformats in addition to axial source images. The distal ICA was measured well beyond the bulb where the walls are parallel and no longer tapering from the carotid bulb as per NASCET.5, 7, 20, 21 Distal external carotid artery (ECA) diameter was measured on axial images at a similar level as the distal ICA measurement. The aim of this study was to establish a relationship between directly measured millimeter stenosis with well-known NASCET-style percent stenosis ratios. Additional evaluation of stenosis outliers, such as near-occlusion, is currently taking place. 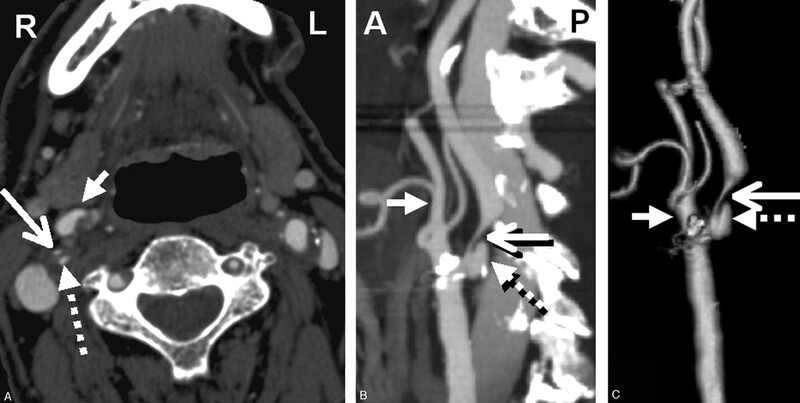 Each carotid artery was considered unique for statistical purposes, except in the evaluation of suspected near-occlusions. Pearson product-moment correlation coefficients were calculated to evaluate interobserver agreement of all millimeter measurements, before evaluation of potential near-occlusions. All distal ICAs were evaluated for potential near-occlusion as described in the previous section. Percent stenosis ratios were calculated for each carotid, except for the suspected near-occlusions. A Pearson product-moment correlation coefficient was calculated between the millimeter stenosis (independent variable) and derived percent stenosis (dependent variable), followed by regression analysis. Sensitivity and specificity calculations were performed to validate the use of millimeter stenosis measurements as a test to detect carotid disease. Specifically for these calculations, a severely diseased carotid artery was defined if its NASCET-style percent stenosis ratio was ≥70%, as calculated from CTA measurements.1, 4, 6, 7 Regression analysis identified the millimeter measurement of the stenotic lumen corresponding to the 70% carotid stenosis ratio. True-positive cases are those with a carotid stenosis measurement at the defined millimeter threshold or smaller and with a derived NASCET-style percent stenosis ratio of 70% or greater. False-positive cases are those with a carotid stenosis measurement at the millimeter threshold or smaller, and with NASCET-style percent stenosis ratios of <70%. Likewise, true-negative and false-negative cases are those with carotid stenosis measurement greater than the millimeter threshold with NASCET-style percent stenosis ratios of <70% and ≥70%, respectively. Additional calculations were performed to evaluate the validity of millimeter measurements as a test to detect moderate carotid disease (50%–69% stenosis). All raw data were analyzed by using the statistical software package, SPSS for Windows (version 12.0.0; Chicago, Ill). A P value <.01 was considered to indicate a statistically significant difference. All missing data were excluded from calculations in a pairwise fashion. All correlation values were calculated with 2-tailed significance. CTAs were studied for 8 consecutive months (August 2003–March 2004), during which a total of 466 extracranial carotid arteries were imaged. A total of 268 carotid arteries were imaged to evaluate known or suspected ICA disease, meeting the inclusion criteria of the study. Of these, 192 carotid arteries were known to have atherosclerotic disease. The remaining 76 were imaged to evaluate cases of stroke with a suspected carotid cause. A total of 198 carotid arteries did not meet inclusion criteria. Of them, 88 were imaged to evaluate cases of trauma/dissection. Thirty-two carotid arteries were imaged in cases evaluating vascular anomaly/malformation. Forty-six were imaged during evaluation of the posterior circulation. Twenty-four carotid arteries were imaged during evaluation of the neck for tumor. Six were excluded because of inadequate coverage of the cervical carotid arteries and/or technical errors, including motion artifact from swallowing. Two carotid arteries had very attenuated calcification surrounding their severely stenosed vessel lumens. In both of these cases, the narrowing between calcifications measured small enough to be severe stenosis (>70%). Because of beam-hardening artifact, however, the actual residual arterial lumen could not be confidently detected apart from potential plaque that may have further restricted the luminal diameter. The uncertainty of these 2 cases is not a question of severe stenosis; instead, it is the degree of severity that could not be accurately determined. This difference would not change any clinical decisions or management for these severe stenosis cases. Nonetheless, the need for accuracy within the confines of this study precluded the inclusion of these 2 carotid arteries. Densely calcified carotid arteries included in the study as severe stenosis following endarterectomy were verified as severe with surgical and pathology correlation. The 268 carotid arteries included in the study were independently analyzed and measured by each of the 2 neuroradiology reviewers. 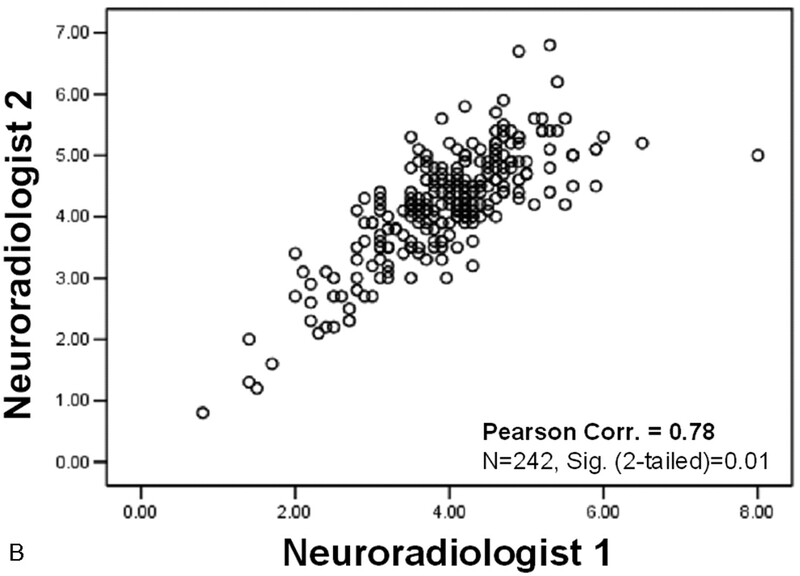 Interobserver agreement correlation values for all carotid measures were excellent: (1) maximum ICA bulb stenosis correlation coefficient = 0.85 (n = 178); (2) distal ICA diameter = 0.78 (n = 242; Fig 4A, -B). Correlation scatter plots. Interobserver agreement between reader measurements. A, Maximum stenosis (mm). B, Distal ICA (mm). C, Derived NASCET-style percent stenosis. (Correlations: 2-tailed significance = 0.01. n values reflect exclusion of pairwise missing data; excludes “near-occlusion” cases). From the population of 268 carotid arteries, 42 were excluded from percent stenosis calculations because of diagnosis or suspicion of near-occlusion, because such calculations would produce fallacious results.3,5–7, 21–24 NASCET-style percent ratios were calculated for each carotid artery. The interobserver agreement correlation value for the percent stenosis ratio was excellent, as expected on the basis of the excellent correlation of the millimeter stenosis and distal ICA measurements (percent stenosis ratio interobserver correlation = 0.89; n = 207 [Fig 4C]). The relationship between millimeter stenosis and percent stenosis was calculated for each reader by using the Pearson product-moment test. 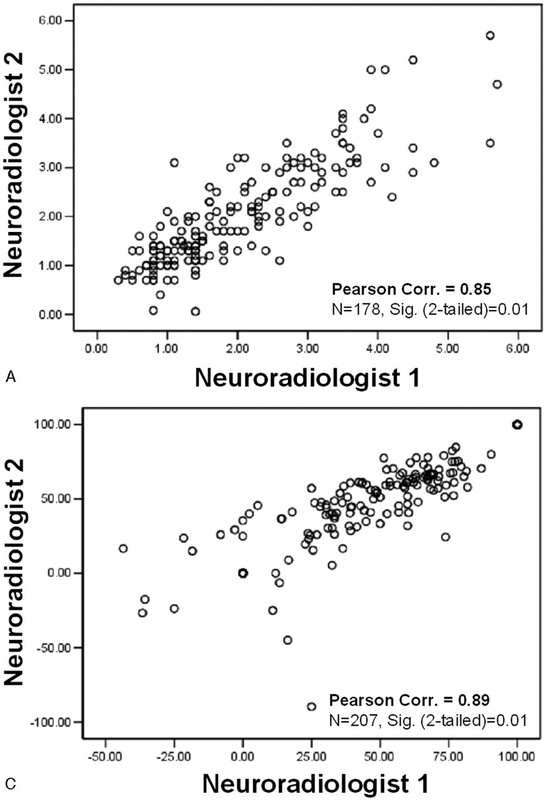 Data from both neuroradiology reviewers showed a linear relationship with excellent correlation between the millimeter stenosis test statistic and the NASCET-style reference statistic. Reviewer 1 had a Pearson correlation of −.923 (n = 162). Reviewer 2 had a Pearson correlation of −.933 (n = 141). In light of the excellent correlation of the readers, millimeter stenosis and distal ICA measurements were averaged, respectively, per carotid artery and used to calculate “mean” percent stenosis. Data pairs of “mean” millimeter stenosis and associated “mean” percent stenosis also showed a linear relationship between the variables, with excellent correlation (Pearson product-moment correlation coefficient of −.95; n = 136 [Fig 5]). Linear regression. Mean percent stenosis to mean millimeter maximum carotid bulb stenosis. (Pearson correlation = −0.95; n = 136; 2-tailed significance = 0.01; R2 linear = 0.895; SE of estimate = 7.63; B value = −21.539). Of the 136 carotid arteries in the final analysis, the average millimeter stenosis was 2.3 mm (SD = 1.0), the average distal ICA diameter was 4.4 mm (SD = 0.9), and the average percent stenosis was 47.7% (SD = 23.5). In our population, severe carotid stenosis was defined as ≥70% stenosis, as in NASCET.1 On the basis of NASCET-style mean percent stenosis ratios, the prevalence of severe stenosis in our final carotid population was 12.5% (n = 136). 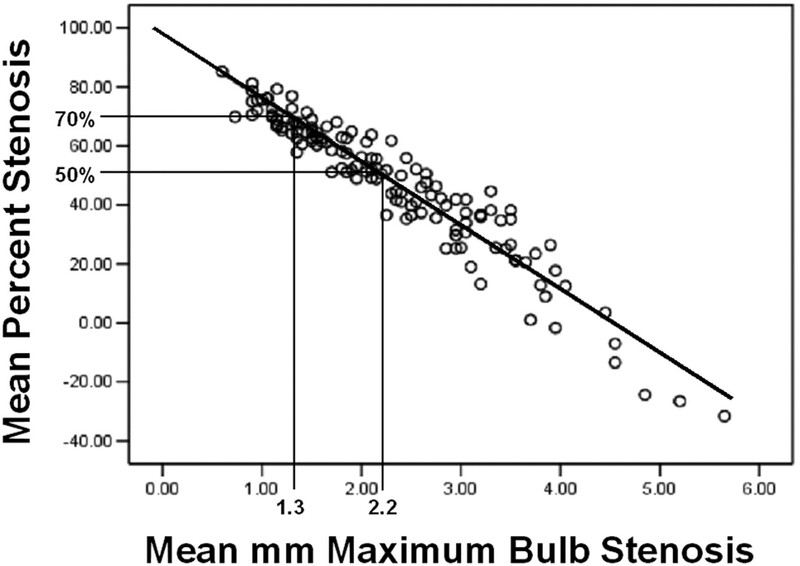 By regression analysis, a 1.3-mm stenotic carotid lumen corresponds to 70% stenosis (Table 1). Using the millimeter stenosis threshold of ≤1.3 mm to indicate severe stenosis, CTA millimeter stenosis screening for severe carotid stenosis has a sensitivity of 88.2% and a specificity of 92.4%. The positive predicted value (PPV) is 62.5%, and the negative predicted value (NPV) is 98.2%. In 1998, the NASCET Group published its final results.6 These results showed a lower risk of stroke and a lower value of stroke prevention with revascularization in the group of symptomatic patients with moderate stenosis compared with patients with severe stenosis. These patients had derived percent stenosis ratios of 50%–69%. By use of regression analysis, this moderate group has a corresponding measurement of 2.2 mm (50%) and 1.4 mm (69%). Forty-one percent (56 carotid arteries; n = 136) of our final carotid population had moderate disease by NASCET-style ratio calculations (50%–69% stenosis; Table 2). CTA millimeter stenosis screening for moderate disease (1.4–2.2 mm, inclusive) correctly identified 42 of the 56 carotid arteries. Nine of the misidentified carotid arteries had stenosis measurements of ≤1.3 mm, corresponding to severe disease based on regression analysis. The remaining 5 had millimeter stenosis measurements >2.2 mm, corresponding to milder disease based upon regression analysis. The resultant sensitivity of CTA millimeter stenosis screening for moderate stenosis is 75.0% with a specificity of 93.8%. The PPV is 89.4%, and the NPV is 84.3%. On the basis of the NASCET-style ratio calculations, 46% of our final carotid population (63 carotid arteries; n = 136) had carotid stenosis of <50%. CTA screening with a threshold stenosis value of >2.2 mm identified this group with a sensitivity of 95.2% and a specificity of 93.2%. The PPV is 92.3%, and the NPV is 95.8%. In any study of unproven technique, it is necessary to compare the test statistic with a recognized standard. We define our standard as the NASCET method of ratio calculation, which is proven effective when applied to CTA.12–13, 15–16, 18–19 Our test statistic is the millimeter stenosis measurement. In this study, we compared the millimeter stenosis test statistic with the NASCET standard in each carotid artery, providing each with its own control. Similar to other investigators, we found that carotid wall calcifications can complicate evaluation of stenosis on 2D MPR and 3D rendered images.19 As have other investigators, we found that the axial source images are key to CTA carotid stenosis evaluation.13, 19 Axial source images allow good visualization of the patent lumen apart from vessel wall plaque, even with calcium on the sides (Fig 6). Axial source images of left severe ICA stenosis; small residual lumen with vessel wall plaque and thick calcification on the sides. A, Source axial image with “standard” W : L settings for CTA evaluation (W 750 : L 200). B, Magnified left ICA (W 750 : L 200). C, Magnified with wide window for appropriate visualization and measurement of residual carotid lumen (W 900 : L 275). A wider W : L setting allows conspicuity between the different attenuations of contrast in lumen and calcification along the sides. In our experience, carotid bulb calcifications rarely limit stenosis evaluation on the axial source images. In fact, we were unable to confidently separate residual carotid lumen from potential calcified plaque in the narrow space between thick calcifications in only 2 carotids, precluding measurement of the stenotic lumen. In these cases, however, the measurement of the available space between highly attenuated calcification was <1 mm, surpassing our threshold value of 1.3 mm (70% stenosis) and confidently indicating severe disease. A more precise millimeter measurement indicating the degree of severe stenosis (such as 85% versus 95%) would not change any clinical or management decisions. With calcifications further apart, beam-hardening artifact does not obscure the lumen in the same way, allowing for confident measurements of less-severe stenoses, even with associated noncalcified plaque (Fig 6). Another potential concern is the limitation of the measuring tools on the current AGFA Impax workstation as well as on any other PACS systems. We need measurement tools that are not only accurate to a submillimeter scale, but also can be applied easily and with accuracy and reproducibility between users. The available PACS measuring tool has arithmetic accuracy to submillimeters and must be placed manually with the mouse. If an electronic caliper was available that could be moved a pixel at a time, rather than freehand with the mouse, the process would be easier and maybe even more accurate. In a sense, this current system has similar problems as hand-held rulers and the jeweler’s eyepiece used in NASCET.1, 7 There is a certain skill or “art,” however, to deploying such devices. Anyone familiar with measuring vessels from CTA or from other digitized systems (including DSA and MR angiography [MRA]) is aware of the “fuzzy” edge created when images are significantly magnified. Most of our measurements were obtained with minimal—if any—magnification. Magnification was used in this study if the residual vessel lumen was diminutive, usually <2 millimeters, and difficult to measure on original images. In these cases, measurements were obtained with the cursor at the midpoint of the outer “fuzzy” border, as in the middle of the perceived bell-shaped curve of the artery edge. The appropriateness of all cursor placements was verified on the unmagnified source images. Despite these issues, we were able to measure values independently with low interobserver variability (high interobserver correlation; range, 0.78–0.89). CTA is an anatomic study of arteries, allowing for direct evaluation of carotid stenosis. CTA is fast, with images of the head and neck acquired over approximately 15 seconds during contrast injection. 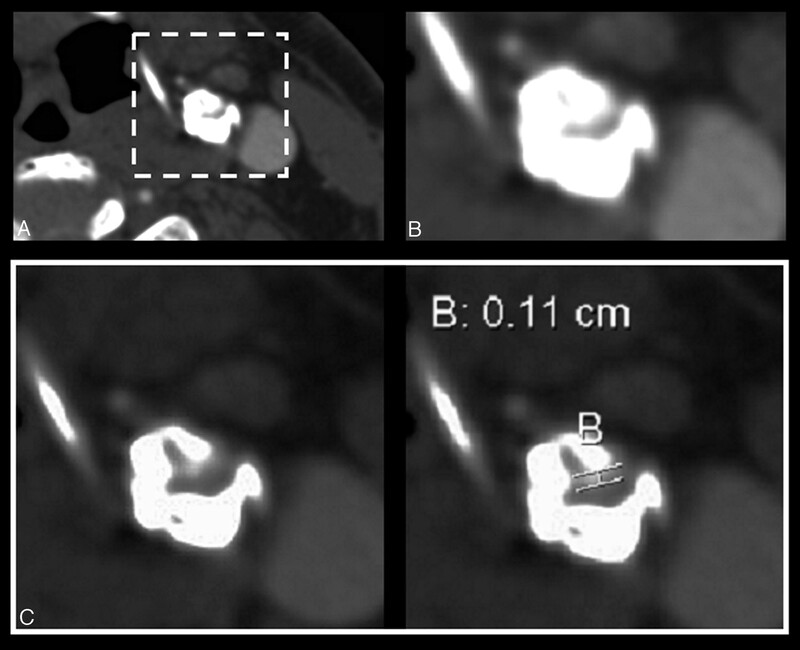 With a 512 × 512 memory matrix (equivalent to 262,144 pixels of information), multidetector CT scanners allow acquisitions with near-isotopic spatial resolution and an effective section thickness as small as 0.75 mm.25 For evaluation of carotid arteries and the cerebral vasculature, it is possible to narrow the nominal section thickness to obtain a submillimetric dataset. This ability, combined with 3D image rendering, provides an “unprecedented volumetric spatial resolution for any imaging technique.”25 In light of the relative benefits of CTA in reference to safety, time, and related lower cost than DSA, it is compelling to use CTA when the indication for angiography is not to make the diagnosis, but to accurately characterize the degree of stenosis. By necessity of available equipment, we used 4-channel CT; CTA is very convenient and useful at this level. Improvements are expected with 16-, 64-, and more channels, especially to minimize venous filling. The latter is not an artifact for neck carotid imaging, because arteries are easily recognized as distinct from veins. Current CE MRA, however, has imaging differences with CTA. An advantage of CTA is that images can be acquired in a few seconds from aortic arch to vertex with a narrow axial field of view with high resolution. CE MRA for neck and head is acquired in a coronal direction with a wide field of view, yielding a lower resolution. It is important to recognize that both CT and MR modalities continue to show important advances. Thus, such relative comparisons may change with further advancements. CTA also allows for direct evaluation of the vessel wall and the surrounding soft tissues with high spatial resolution and anatomic detail that cannot be obtained as easily with other methods. Despite these advantages, MR is unique in its ability to demonstrate methemoglobin within wall plaque.29 The ability to evaluate the nature of a plaque has obvious implications regarding the stability of a stenosis, and may ultimately be more predictive of impending stroke than stenosis measurements. When the purpose of carotid imaging is to quantify the degree of stenosis, the safest, most-effective, and cost-efficient study should be performed. The serious stroke complication rates of conventional angiography are low,30–32 having been reported as high as 1.2% by the Asymptomatic Carotid Atherosclerosis Study.30 This risk has affected the practice by many surgeons of accepting a less-than-accurate percent stenosis determination by duplex sonography without additional imaging. Because of inherent risk, patient discomfort, cost, limited views, and variability of percent stenosis calculation methods, DSA could now be considered less desirable than CTA for mere measurement of stenosis. In other angiographic situations, such as evaluation of the early venous drainage in a vascular malformation or directional filling of collateral vessels, DSA continues to have an advantage over current technology CTA for sequential studies. Further CTA development may make such temporal CTA studies practical. With advancements in detector systems at 64-section and greater, the possibility of repeated high-resolution exposures over wide fields of view may eventually blur the distinctions between DSA and CTA. With such capabilities, sequential CTA series may be a reality in the near future. There is a linear relationship between millimeter carotid bulb stenosis diameter and derived percent stenosis as used in NASCET, allowing prediction of NASCET-type percent stenosis from directly measured millimeter stenosis on CTA. Threshold values of 1.4–2.2 mm can be used to evaluate for moderate stenosis (50%–69% as calculated in NASCET) with a sensitivity of 75.0% and a specificity of 93.8%. A carotid bulb diameter measurement of 1.3 mm corresponds to 70% stenosis (as calculated in NASCET) and can be used as a threshold value to test for severe carotid artery stenosis (≥70%) with a sensitivity of 88.2% and a specificity of 92.4%. With a negative predicted value of 98.2%, a direct stenosis measurement is an excellent tool to verify or rule out severe carotid bulb disease, by using a threshold value of ≤1.3. CTA allows accuracy in the determination of the degree of carotid stenosis without the stroke risk and high costs of DSA. Direct measurement of carotid stenosis by CTA is quick, safe, and easy and has excellent correlation to NASCET-style ratio calculations. Direct stenosis millimeter measurements avoid potentially fallacious ratio calculations due to improperly measured distal ICAs, such as within the zone of carotid bulb tapering or for narrowed ICAs from near-occlusion. Use of millimeter measurements as an indication of disease when considering revascularization still needs to consider the possibility of ipsilateral near-occlusion or contralateral carotid disease, which may influence decisions. Carotid Artery Stenosis: Making Complex Assessments of a Simple Problem or Simplifying Approach to a Complex Disease? Quantification of Carotid Stenosis on CT Angiography-- Does Gender Matter?